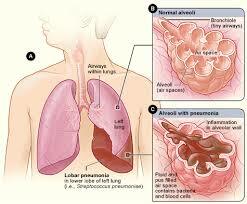 few cases are caused by klebsiella pneumonia and Staph aureus. healthy individuals between 30 - 50 years of age. 4. 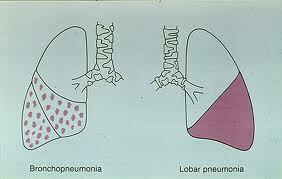 Lobar pneumonia causes consolidation of whole lobe..
5. Complications: bacteremia, Meningitis, Endocarditis, Septic arthritis. from chronic debilitating illness or immuno-suppression. with low grade fever and productive cough of purulent sputum. 5. Complications: Fibrosis, bronchiectasis, Lung abscess.